In consultation with the customer, WPS opted for a combination of manual labor and automation in order to maintain sufficient flexibility. In the process, the orchids are manually picked from the container and placed in an oval plant carrier in the Product Order System. The plant is then automatically guided past one of the six SS3D Vision units, which WPS has programmed to assess the plant for height, number of branches, number of branches and delivery class based on flowering percentage. In the tray entry positions, Ter Laak employees check the orchids and place them in the transport tray. The tray continues its way over the SmartFlo system either to the container buffer or to the tray buffer of 52 gutters. From this buffer the plants are called to the packing stations, where they are made ready for transport to the customer. WPS takes care of the entire logistics system, including an innovative potting and spacing line, fully automatic sorting with 3D camera unit, stick sticking stations, a delivery buffer with trays and packing stations. Three-dimensional robotic arms are used to place the orchids in so-called Plant Growth Cells and transfer them to the cultivation tables. 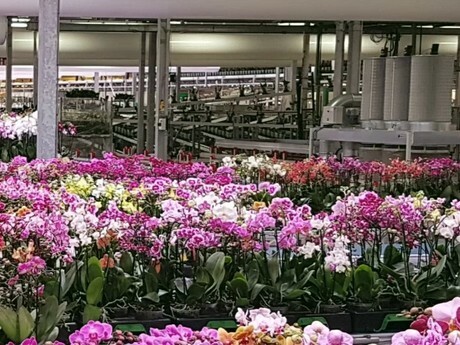 With its progressive automation, orchid grower Ter Laak wants to respond better to the rapidly changing market demands with a growing number of small orders. Flexibility in automation was also an important issue at Ter Laak Orchids.